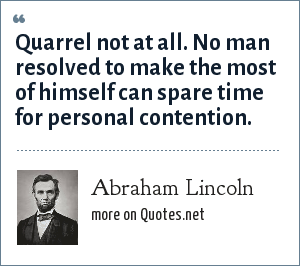 Abraham Lincoln: Quarrel not at all. No man resolved to make the most of himself can spare time for personal contention. "Abraham Lincoln Quotes." Quotes.net. STANDS4 LLC, 2019. Web. 23 Apr. 2019. <https://www.quotes.net/quote/2460>.